Abiotic factors that influence aquatic biomes include light availability, depth, stratification, temperature, currents, and tides. In aquatic biomes, light is an important factor that influences the communities of organisms found in both freshwater and marine ecosystems. In freshwater biomes, stratification, a major abiotic factor, is related to the energy aspects of light. Marine systems are influenced by the physical water movements, such as currents and tides, along with the thermal properties of water. Oceans zones can be categorized into photic or aphotic zones, depending on the presence or absence of light and photosynthesis. As with terrestrial biomes, aquatic biomes are influenced by a series of abiotic factors. However, these factors differ since water has different physical and chemical properties than does air. Even if the water in a pond or other body of water is perfectly clear (there are no suspended particles), water, on its own, absorbs light. As one descends into a deep body of water, there will eventually be a depth which the sunlight cannot reach. While there are some abiotic and biotic factors in a terrestrial ecosystem that might obscure light (such as fog, dust, or insect swarms), usually these are not permanent features of the environment. The importance of light in aquatic biomes is central to the communities of organisms found in both freshwater and marine ecosystems. In freshwater systems, stratification due to differences in density is perhaps the most critical abiotic factor and is related to the energy aspects of light. The thermal properties of water (rates of heating and cooling) are significant to the function of marine systems and have major impacts on global climate and weather patterns. Marine systems are also influenced by large-scale physical water movements, such as currents; these are less important in most freshwater lakes. The ocean is categorized by several areas or zones. All of the ocean’s open water is referred to as the pelagic realm (or zone). The benthic realm (or zone) extends along the ocean bottom from the shoreline to the deepest parts of the ocean floor. Within the pelagic realm is the photic zone, which is the portion of the ocean that light can penetrate (approximately 200 m or 650 ft). At depths greater than 200 m, light cannot penetrate; thus, this is referred to as the aphotic zone. The majority of the ocean is aphotic, lacking sufficient light for photosynthesis. The deepest part of the ocean, the Challenger Deep (in the Mariana Trench, located in the western Pacific Ocean), is about 11,000 m (about 6.8 mi) deep. To give some perspective on the depth of this trench, the ocean is, on average, 4267 m or 14,000 ft deep. These realms and zones are relevant to freshwater lakes as well, as they determine the types of organisms that will inhabit each region. Oceanic zones: The ocean is divided into different zones based on water depth, light availability, and distance from the shoreline. 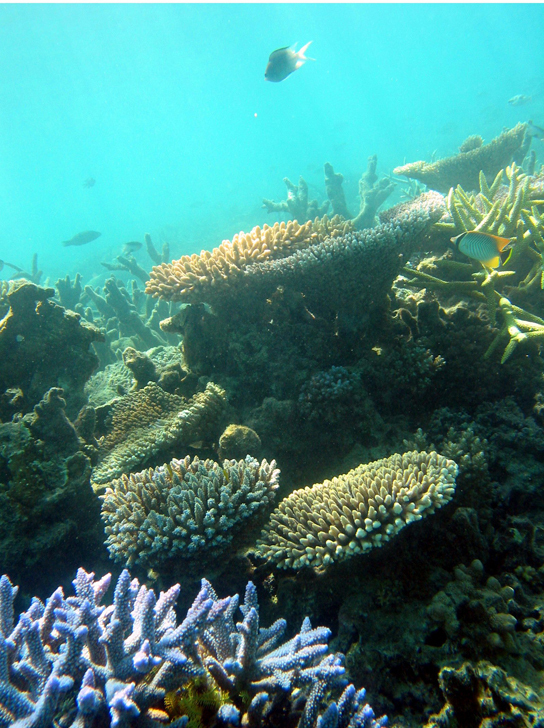 The ocean and coral reefs make up two types of marine biomes where organisms are influenced by depth and light availability. The ocean is divided into different zones with groups of species adapted to deal with the differences in light level, as well as other biotic and abiotic conditions particular to the zones. The intertidal zone is characterized by its high and low tides, as well as wave action; as the zone closest to land, it can be a sandy, rocky, or muddy beach. The neritic zone is silted, well-oxygenated, low in pressure, and stable in temperature; it is adjacent to the oceanic zone, in which warm and cold waters mix due to currents in the open ocean. The benthic zone is nutrient rich because of the sand, silt, and dead organisms that comprise the bottom of the region; as water depth increases, temperature within this deepwater region decreases. The abyssal zone is the deepest part of the ocean and, as such, it is cold, has very high pressure, high oxygen content, and low nutrient content. Coral reefs are ocean ridges formed by a mutualistic relationship between cnidarians and photosythetic algae; climate change and run-off are just two reasons why these important organisms are now in decline. The ocean is the largest marine biome. It is a continuous body of salt water that is relatively uniform in chemical composition; it is a weak solution of mineral salts and decayed biological matter. Within the ocean, coral reefs are a second kind of marine biome. Physical diversity has a significant influence on the ocean, which is categorized into different zones based on how far light reaches into the water. Each zone has a distinct group of species adapted to the biotic and abiotic conditions particular to that zone. The intertidal zone (between high and low tide) is the oceanic region that is closest to land. It includes sandy beaches, but can also be rocky or muddy. This zone is an extremely variable environment because of tides. Organisms, exposed to air and sunlight at low tide, are underwater most of the time, especially during high tide. Therefore, living things that thrive in the intertidal zone are adapted to being dry for long periods of time. Since the shore of the intertidal zone is repeatedly struck by waves, the organisms found there are adapted to withstand damage from the pounding action of the waves. The exoskeletons of shoreline crustaceans are tough, protecting them from desiccation and wave damage. 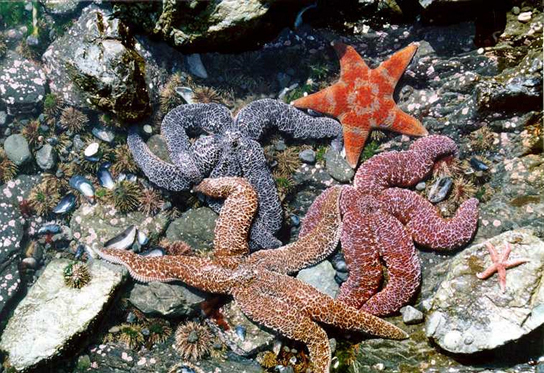 Intertidal zone species: Sea urchins, mussel shells, and starfish, often found in the intertidal zone, are adapted to this rugged environment. 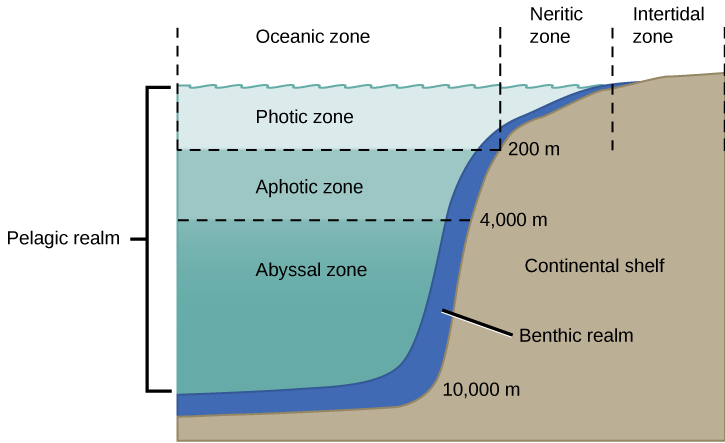 The neritic zone extends from the intertidal zone to depths of about 200 m (or 650 ft) at the edge of the continental shelf. Since light can penetrate this depth, photosynthesis can occur in the neritic zone. The water here contains silt, is well-oxygenated, low in pressure, and stable in temperature. Phytoplankton and floating Sargassum, a marine seaweed, provide a habitat for some sea life found in the neritic zone, including zooplankton, protists, small fishes, and shrimp, which are the base of the food chain for most of the world’s fisheries. Beyond the neritic zone is the open ocean area known as the oceanic zone. Within the oceanic zone there is thermal stratification where warm and cold waters mix because of ocean currents. Abundant plankton serve as the base of the food chain for larger animals. Nutrients are scarce in this less-productive part of the marine biome. When photosynthetic organisms and the protists and animals that feed on them die, their bodies fall to the bottom of the ocean where they remain. In contrast to freshwater lakes, the open ocean lacks a process for bringing the organic nutrients back up to the surface. The majority of organisms in the aphotic zone include sea cucumbers and other organisms that survive on the nutrients contained in the dead bodies of organisms in the photic zone. A lower layer is the benthic realm, the deepwater region beyond the continental shelf. The bottom of the benthic realm comprises sand, silt, and dead organisms. Temperature decreases, remaining above freezing, as water depth increases. Due to the dead organisms that fall from the upper layers of the ocean, this nutrient-rich portion of the ocean allows a diversity of life to exist, including fungi, sponges, sea anemones, marine worms, sea stars, fishes, and bacteria. Coral reefs: Coral reefs are formed by the calcium carbonate skeletons of coral organisms, which are marine invertebrates in the phylum Cnidaria. The deepest part of the ocean, the abyssal zone, at depths of 4000 m or greater, is very cold and has very high pressure, high oxygen content, and low nutrient content. There are a variety of invertebrates and fishes found in this zone, but the abyssal zone does not have plants due to the lack of light. Coral reefs are ocean ridges formed by marine invertebrates living in warm, shallow waters of the ocean. They are found in the photic zone and are important in shore protection. Other coral reef systems are fringing islands, which are directly adjacent to land, or atolls, which are circular reef systems surrounding a former landmass that is now underwater. The coral organisms are colonies of cnidarian polyps that secrete a calcium carbonate skeleton, which slowly accumulates, forming the underwater reef. Corals found in shallower waters have a mutually symbiotic relationship with photosynthetic unicellular algae, which provides corals with the majority of the nutrition and the energy they require. The waters are nutritionally poor; therefore, without this mutualism, it would not be possible for large corals to grow. In contrast, corals living in deeper and colder water attain energy and nutrients by capturing prey using stinging cells on their tentacles. Climate change and human activity pose dual threats to the long-term survival of the world’s coral reefs. Corals evolved to survive at the upper limit of ocean water temperature. Excessive warmth induced by climate change causes reefs to expel their symbiotic, food-producing algae, resulting in a phenomenon known as bleaching. When bleaching occurs, the reefs lose much of their characteristic color as the algae and the coral animals die if loss of the symbiotic zooxanthellae is prolonged. Estuaries, composed of a mix of fresh and salt water and their living communities, are influenced by salinity and the changing tides. Estuaries acts as nursery grounds for crustaceans, mollusks, and fish. Salinity, regulated by the influx of seawater and outflow of freshwater once or twice each day, is a determining factor in the types of organisms that can live there. To deal with the short-term and rapid variation in salinity, estuary species have developed specialized adaptations that enable them to live with the salty conditions; as a result, most plant species found in estuaries are halophytes. Estuaries form a unique marine biome that occurs where a source of fresh water, such as a river, meets the ocean. Therefore, both fresh water and salt water are found in the same vicinity. Mixing results in a diluted (brackish) saltwater. Estuaries form protected areas where many of the young offspring of crustaceans, mollusks, and fish begin their lives. Salinity of estuaries is a very important factor that influences the organisms found there and their adaptations. The salinity, which varies, is based on the rate of flow of its freshwater sources. Once or twice a day, high tides bring salt water into the estuary. Low tides, occurring at the same frequency, reverse the current of salt water. Low tide: The salinity levels within an estuary are dependent on the tides; during low tide, salt water influx levels are reduced. The short-term and rapid variation in salinity due to the mixing of fresh water and salt water is a difficult physiological challenge for the plants and animals that inhabit estuaries. Many estuarine plant species are halophytes: plants that can tolerate salty water on their roots or sea spray. In some halophytes, filters in the roots remove the salt from the water that the plant absorbs. Other plants are able to pump oxygen into their roots. Animals, such as mussels and clams, have developed behavioral adaptations that expend a lot of energy to function in this rapidly-changing environment. When these animals are exposed to low salinity, they stop feeding, close their shells, and switch from aerobic respiration (in which they use gills) to anaerobic respiration (a process that does not require oxygen). When high tide returns to the estuary, the salinity and oxygen content of the water increases, causing these animals to open their shells, begin feeding, and to return to aerobic respiration. Lakes, ponds, rivers, streams, and wetlands are all freshwater biomes, which differ in depth, water movement, and other abiotic factors. Temperature, as well as the availability of nitrogen and phosphorus, are factors that affect living things in lakes and ponds. 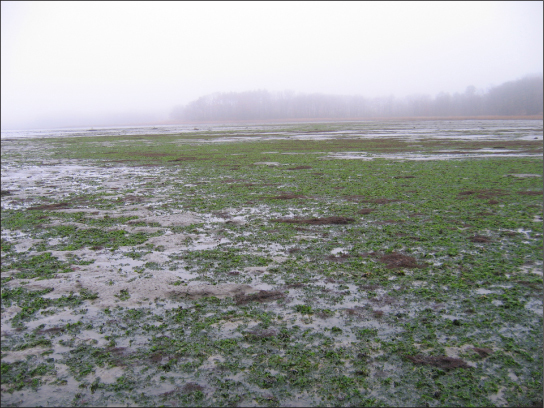 When available in large amounts, nitrogen and phosphorus cause potentially-detrimental algal blooms in lakes; nitrogen is also a limiting factor for plant growth in bogs. The continuous movement of rivers and streams are their defining characteristic; these bodies of water carry large amounts of water from the source to a lake or ocean. Wetlands are shallow bodies of water with soil that is either permanently or periodically saturated with water; every type of wetland has three shared characteristics: their hydrology, hydrophytic vegetation, and hydric soils. Freshwater biomes occur throughout the world’s terrestrial biomes. They include lakes and ponds, rivers and streams, and wetlands. Lakes and ponds can range in area from a few square meters to thousands of square kilometers. Temperature is an important abiotic factor affecting organisms found there. In the summer, thermal stratification of lakes and ponds occurs when the upper layer of water is warmed by the sun, but does not mix with deeper, cooler water. Light can penetrate within the photic zone of the lake or pond. Phytoplankton found here carry out photosynthesis, providing the base of the food web. At the bottom of lakes and ponds, bacteria in the aphotic zone break down dead organisms that sink to the bottom. Nitrogen and phosphorus are important limiting nutrients. Because of this, they are determining factors in the amount of phytoplankton growth that occurs in lakes and ponds. When there is a large input of nitrogen and phosphorus (from sewage and run-off from fertilized lawns and farms, for example), the growth of algae skyrockets, resulting in a large accumulation called an algal bloom. These blooms can become so extensive that they reduce light penetration in water. As a result, the lake or pond becomes aphotic: photosynthetic plants cannot survive. When the algae die and decompose, severe oxygen depletion of the water occurs. Fish and other organisms that require oxygen are more likely to die. The resulting dead zones are found across the globe. Algal blooms: The uncontrolled growth of algae in this lake has resulted in an algal bloom. Rivers and streams are continuously moving bodies of water that carry large amounts of water from the source, or headwater, to a lake or ocean. Abiotic features of a river or stream vary along its length. The origin point of streams (source water) is usually cold, low in nutrients, and clear. Because the source channel is narrow, the current is often faster here than at any other point of the river or stream. This fast-moving water results in minimal silt accumulation at the bottom of the river or stream, resulting in clear water. Photosynthesis occurs primarily in algae growing on rocks since the swift current in channels inhibits the growth of phytoplankton. An additional input of energy can come from leaves or other organic material that falls into the river or stream from trees and other plants that border the water. When the leaves decompose, the organic material and nutrients in the leaves are returned to the water. Plants and animals have adapted to this fast-moving water. For instance, leeches have elongated bodies and suckers on both ends that attach to the substrate, keeping the leech anchored in place. As the river or stream flows away from the source, the width of the channel gradually widens and the current slows. This slow-moving water, caused by the gradient decrease and the volume increase as tributaries unite, has more sedimentation. The water is as clear as it is near the source since phytoplankton can be suspended in slow-moving water. The water is also warmer. Worms and insects can be found burrowing into the mud. The higher order predator vertebrates, which include waterfowl, frogs, and fishes, often depend on taste or chemical cues to find prey due to the murkiness of the water. Wetlands are environments in which the soil is either permanently or periodically saturated with water. They differ from lakes in that they are shallow bodies of water. Emergent vegetation consists of wetland plants that are rooted in the soil, but have portions of leaves, stems, and flowers extending above the water’s surface. Types of wetlands include marshes, swamps, bogs, mudflats, and salt marshes. The three shared characteristics among these types are their hydrology, hydrophytic vegetation, and hydric soils. Wetlands: Located in southern Florida, Everglades National Park is vast array of wetland environments, including sawgrass marshes, cypress swamps, and estuarine mangrove forests. 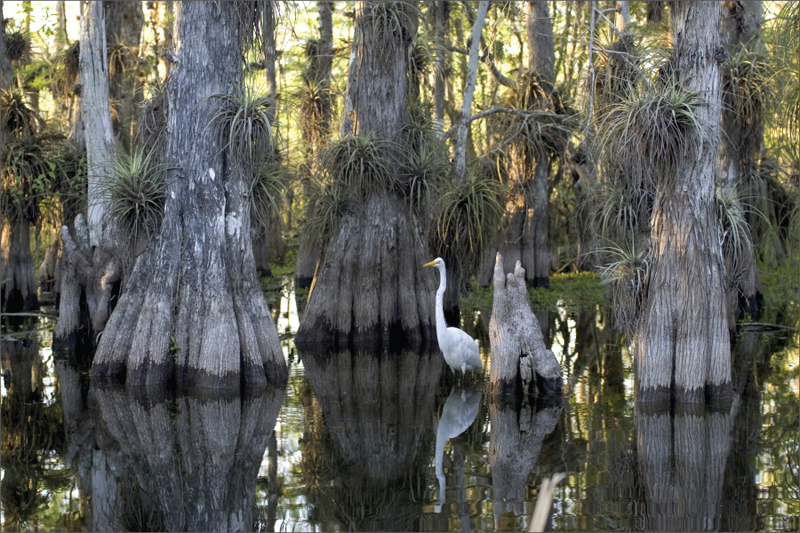 Here, a great egret walks among cypress trees. Freshwater marshes and swamps are characterized by slow and steady water flow. Bogs develop in depressions where water flow is low or non-existent. Bogs usually occur in areas where there is a clay bottom with poor percolation: the movement of water through the pores in the soil or rocks. The water found in a bog is stagnant and oxygen-depleted because the oxygen that is used during the decomposition of organic matter is not replaced, resulting in a slowing of decomposition. This leads to organic acids and other acids building up, which lower the pH of the water. At a lower pH, nitrogen becomes unavailable to plants, creating a challenge for them. Some types of bog plants capture insects and extract the nitrogen from their bodies.